Second half goals from Josimar da Silva Martins and substitute Rakesh Masih kept alive Mohammedan Sporting Clubs semifinal hopes as they downed Kolkata rivals Bhowanipore FC by two goals in a Group D match of the 35th Federation Cup at the MDSC Stadium in Manjeri on Friday afternoon. Josimar scored off Manish Maithani’s corner after Syed Rahim Nabi headed it on for the Brazilian to tap in. Mohammedan Sporting saw their lead getting doubled deep into second half stoppage time when substitute Rakesh Masih sent home a splendid left-footed long ranger that dipped into the net. Five minutes before half-time, Penn Orji‘s penalty came off the crossbar on his second take after his initial attempt was disallowed as Josimar advanced forward before the kick was taken after Bhowanipore FC’s Sourav Chakraborty dashed at Josimar to hand Mohammedan Sporting the spot-kick. The Sanjoy Sen coached outfit could have added a second in the 82nd minute only had their Nigerian playmaker Penn Orji converted from a one on one situation after Syed Rahim Nabi had set him up inside the 18-yard box. It was the 2013 Durand Cup champions who set the pace early on in the first half against the Bordoloi Trophy champions. 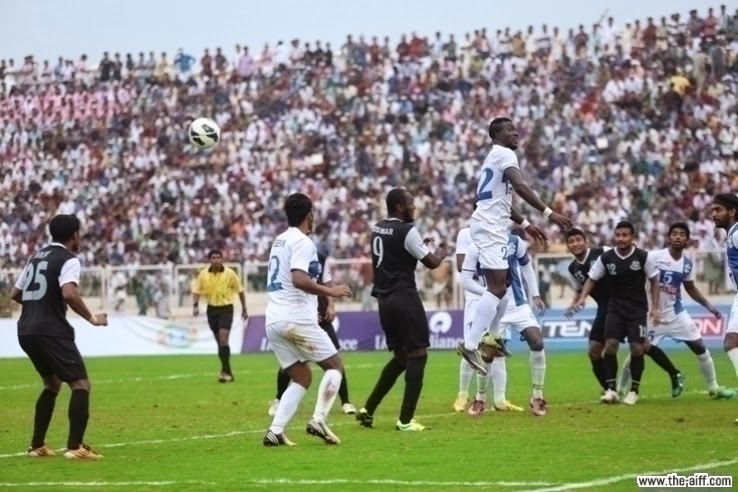 Winning three corners in the first twenty minutes, the Kolkata giants kept their city rivals’ defence on tenterhooks. Midfielder Anthony Soren showed sparks of brilliance making space for himself amidst a sea of legs and teeing up Josimar and Penn on many occasions. Nirmal Chettri also impressed down the right channel with his overlapping runs and inch-perfect crosses inside the area. The first real chance for Mohammedan came in the 16th minute but Nabi shot over from Nirmal’s diagonal cross. Bhowanipore FC had a half chance when Nabin Hela’s attempt off J. Prasad’s cross fizzed across goal. The second-division side did not trouble Mohammedan Sporting at all after that and were insipid throughout the match. While Mohammedan Sporting have six points in their kitty from two matches, Bhowanipore FC are out of the competition having failed to register a win in their two outings so far. Mohammedan Sporting now play Dempo SC in their final match to decide the team which moves on from Group D.